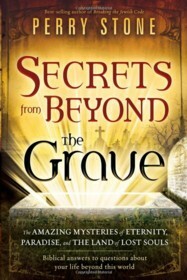 Secrets From Beyond the Grave is a book in the Religion genre written by Perry Stone. The book was published by Charisma House on 2010-09-07 and contains 246 pages. The book has an ISBN number of 978-1616381578. Our users found the overall impression of this book to be Educational. Secrets From Beyond the Grave, by Perry Stone, looks at what happens to us when our time on this Earth ends. He covers several interesting and controversial topics such as: Who will be in heaven? What happens to the souls of aborted infants? What happens to animals and more specifically our pets? Will they be part of the afterlife? In short, this book looks at life after death. Perry Stone is very knowledgeable in biblical studies and prophecy and I have read several of his other works. I have read other books covering similar subject matter but I found this book to be the most insightful. Additionally, I have read through large portions of the bible, and I found some of the facts and knowledge presented here by the author amazing. These bits of information helped hold my focus and attention throughout. As I mentioned above, Stone covers some very interesting topics in this book and he does so with great ability. Unfortunately, I did not agree with how he handled the topic of pets and their place, or more specifically their lack of place, in the afterlife. Other books on the subject explain how animals mean even more to God than to us and how they are therefore cared for after death. This was one of the main areas I felt the book got it wrong and it made it difficult for me to fully appreciate some of the other areas covered in the book because I felt Stone may have "got it wrong" there as well. However, that being said I would still recommend this book to most people as it does contain some very educational material presented in an excellent manner - however, I would not recommend this book if you are a pet person as other books treat the topic with more respect.